With Olive venturing off campus, it's up to her friends at the Detective Club to help her gain control of her powers! But will she fall victim to revenge or can her friends find the truth behind the Book of Gotham? Plus, who is Amity Arkham? 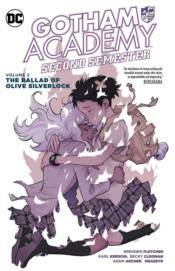 Collects GOTHAM ACADEMY: SECOND SEMESTER #4 and #9-12.